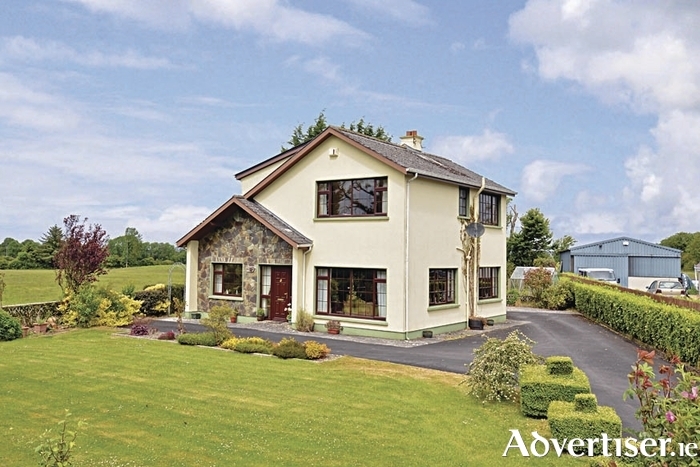 O'Donnellan & Joyce is offering for sale a beautiful four bed detached family home located on the main Loughrea to Gort road, approximately two miles from Loughrea and one mile from Kilchreest village. As with all properties of its era this home would benefit by some modernisation, however it is presented in excellent condition having always been well maintained and cared for. The property has an entrance hall, living room, downstairs bedroom with en suite, and open plan kitchen/dining room. Upstairs the accommodation comprises a main bathroom and a further three bedrooms. Standing on a large site with manicured gardens and a large garage to the rear, this lovely property should suit a discerning purchaser where space inside and out is a must, and the location offers ease of access to all local amenities. Viewing is highly recommended and guaranteed not to disappoint. Contact Colm O'Donnellan or Kyle O'Brien at O'Donnellan & Joyce auctioneers on 091 564212.